This photographer was either sitting in a tree or on a tour from Grizzly Bear Lodge and sitting in the viewing stands. After August 24th grizzly bear tours from our lodge use viewing platforms located on the Glendale River, which flows into Knight Inlet. The stands have an excellent location with the natural river on two sides and the entrance to the man-made spawning channel on a third side. The forth side is the entrance to the stand and is land based so we can drive to the stands and you will not get wet. 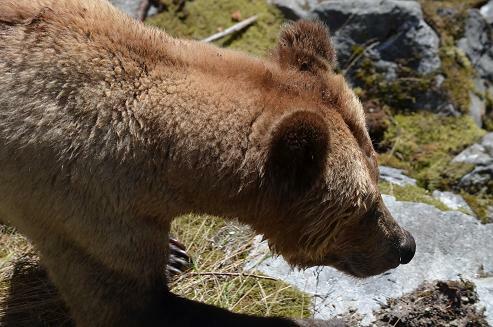 The grizzly bears will pass beneath the stands when moving form the natural river to the entrance of the spawning channel, which is normally full of salmon and the grizzlies preferred fishing spot. Whale watching tours from Grizzly Bear Lodge on Knight Inlet’s Minstrel Island travel about fifty minutes to the viewing area. The viewing area being Johnston Straits between Vancouver Island and mainland British Columbia. Over the past several years the number of humpback whales in this area has increase from three or four per trip to sixteen to eighteen. It is an area with an abundance of feed in the form of herring. The above photo by Gary Wilson of Australia shows a humpback lunge feeding on herring. 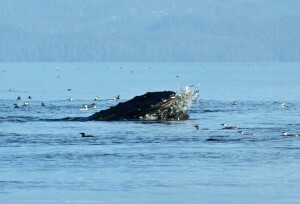 The whales come up beneath a ball of herring with mouths open and try to capture ALL the herring but as this photo shows they are not always successful. You will notice that it is a common enough occurrence that the duck do not seem to be to concerned.